Get ready to love your little cub this Halloween when you dress them in this tiny tiger costume! This boys and girls costume includes a polyester bodysuit that looks and feels like velvet. The orange suit has the authentic-looking black tiger stripes with a white abdomen. It snaps at the back of the neck as well as on the inside of the legs for easy removal. The suit has enclosed feet with grips for paws on the bottom that provide easy traction. The matching tiger headpiece also snaps in the back to secure it in place. It features plush ears as well as synthetic white fur on the sides and a large opening for the face. 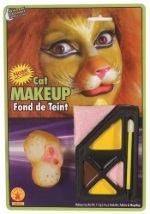 They'll be roaring with joy this Halloween in this adorable tiny tiger costume!